Now that it is officially September, everyone seems excited for fall. Don't get me wrong, I love the fall season but I am also well aware that we still have a couple weeks of summer. I am not ready to give up summer just yet! Most recipes people are posting are starting to showcase spicy autumn-like foods, but my recipe for you today is more of a transitional recipe. This will help you transition perfectly from summer to fall. 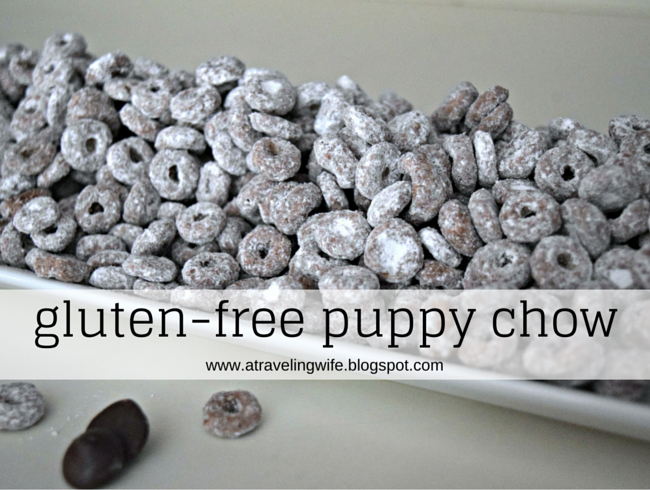 And if you read the title then you already know what I am going to share - gluten free puppy chow. Don't worry if you want to enjoy this recipe outside of the summer and fall months - I'm not judging. As most of you will know, I do not follow a gluten-free diet, but I like to experiment in the kitchen. There are many individuals that have a gluten intolerance, and luckily, Cheerios is joining the masses. They are converting their brand to be gluten free. I am not really sure when all of their products will be converted, but I know it's happening. 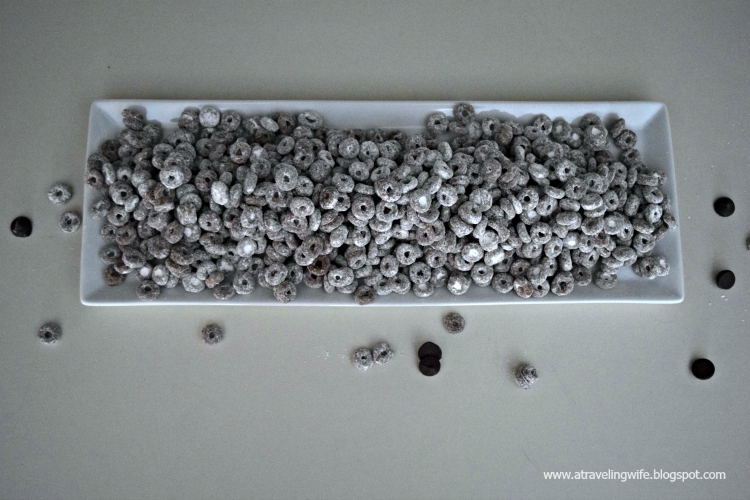 Click to tweet: Gluten-free puppy chow - yum! 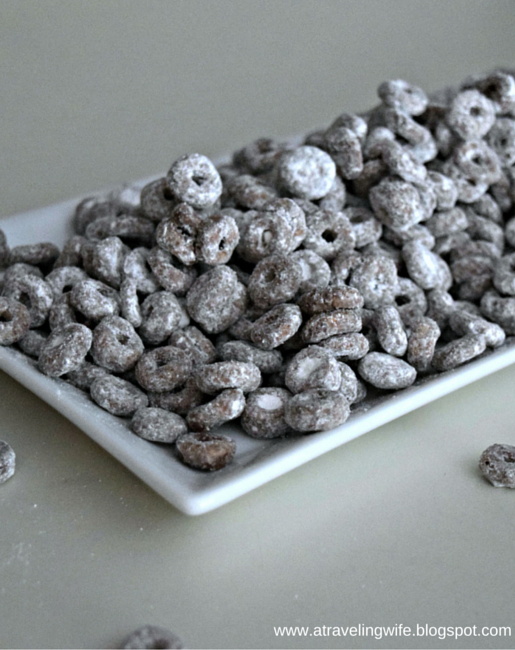 So, the traditional puppy chow you know of is probably made from chex cereal, sugar filled peanut butter, milk chocolate morsels, and butter. Oh, the butter. 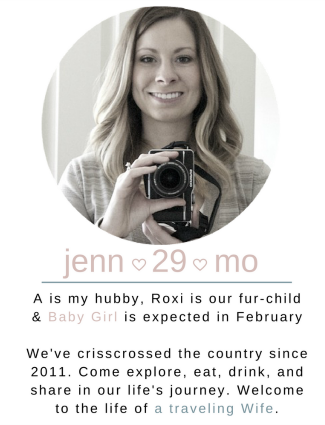 For my health conscious group, don't close the page just yet. Today's puppy chow is made 100% gluten free with Cheerios, natural peanut butter that has one ingredient, dark chocolate morsels, coconut oil, and powdered sugar. First thing is first, measure out all of your ingredients. 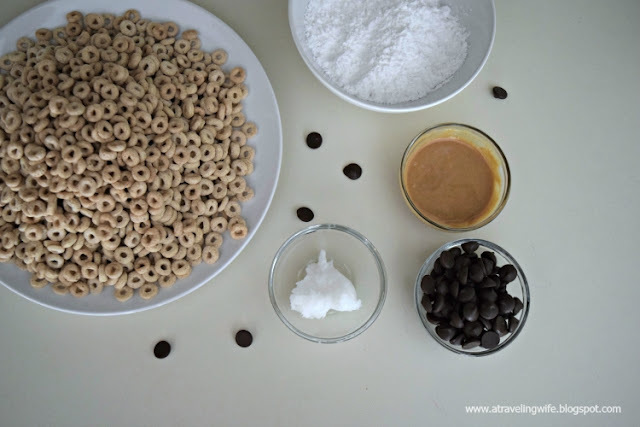 This recipe couldn't be any easier by only having five ingredients: Cheerios, powdered sugar, coconut oil, peanut butter, and chocolate morsels. You will also need a large microwave safe bowl. This is where you will place your coconut oil, peanut butter, and chocolate morsels to melt in the microwave. 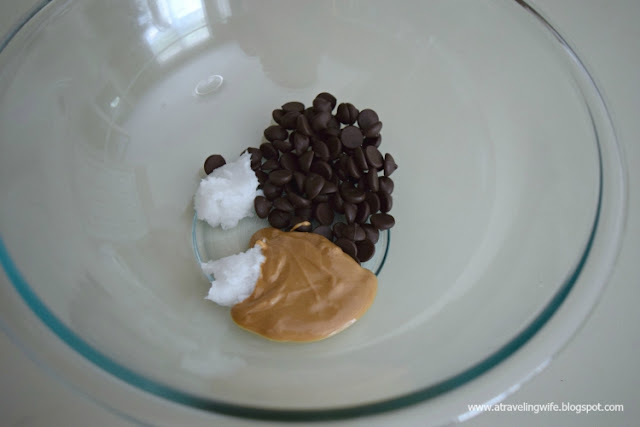 You will want to microwave these three ingredients for one minute, then stir. Most likely the chocolate will not have melted all the way. 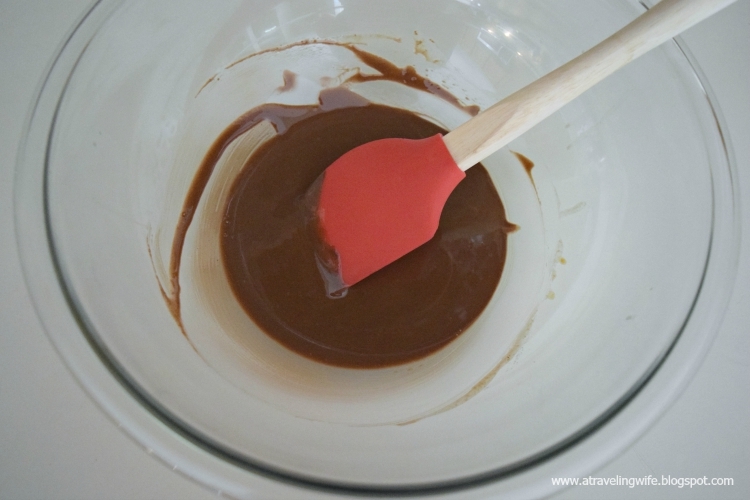 Place back into the microwave for 15 seconds at a time because you do not want to burn the chocolate. 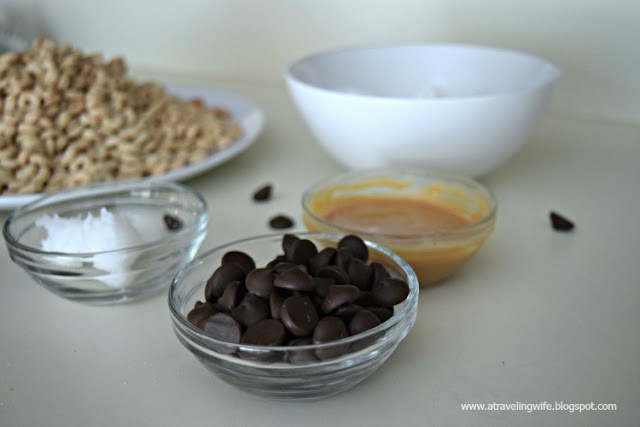 Just a note for those without a microwave (I feel bad for you), you could use a double boiler to melt these three ingredients. This is where the fun really begins. 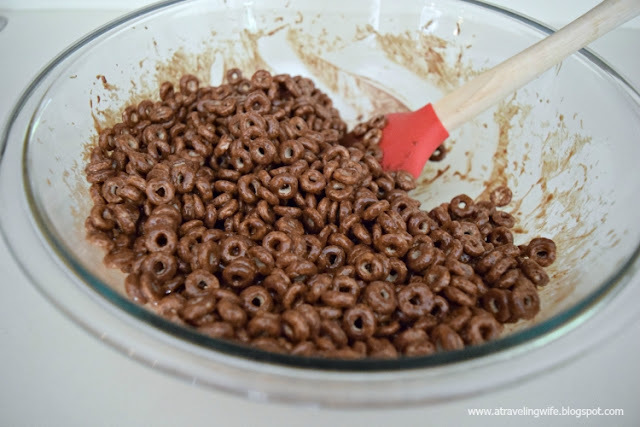 Dump all of the Cheerios into the bowl and gently fold. Coat every crevice of those little o's with the chocolatey peanut butter. After the Cheerios are complete mixed in with the chocolate peanut butter mixture, pour in the powdered sugar. This will coat each o and adhere right to the melted mixture. If the Cheerios are looking a little too wet, just keep adding the powdered sugar. There is no wrong way to do this, people. The Cheerios should now be dusted with some delicious sugary goodness and it's time to enjoy. I highly recommend placing these on a large platter, because they are not going to last long. Have you ever had puppy chow? What's your favorite summer or fall snack? Oooh this looks REALLY good! I've never had puppy chow with Cheerios - good idea! Fantastic idea!! I haven't had puppychow/muddies buddies in years! Oh then you need to make some STAT! They are such a tasty snack to have on hand, plus not all that bad for you either. Aw yay, puppy chow!! How cute & delicious. Coconut oil can seriously do anything.